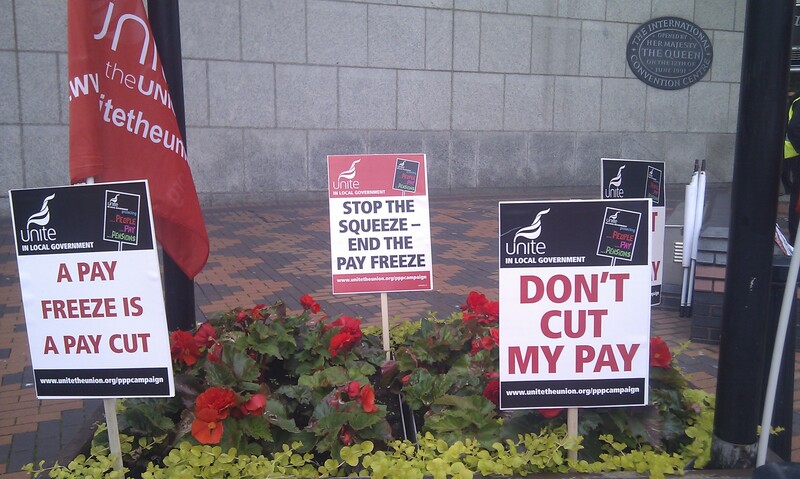 Around 80 local government workers in the Unite Union gathered outside the ICC yesterday, along with 10 Birmingham Against the Cuts members in support, to demonstrate at 3 years of pay freezes for local government workers. 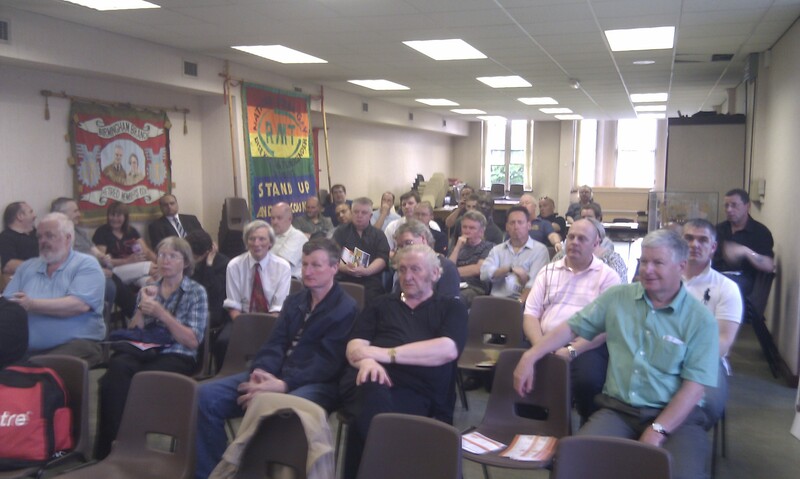 This is part of the People, Pay, Pensions campaign that the union is running. Local Government workers have seen pay decrease by 11% in real terms as a third year of pay freezes takes place. 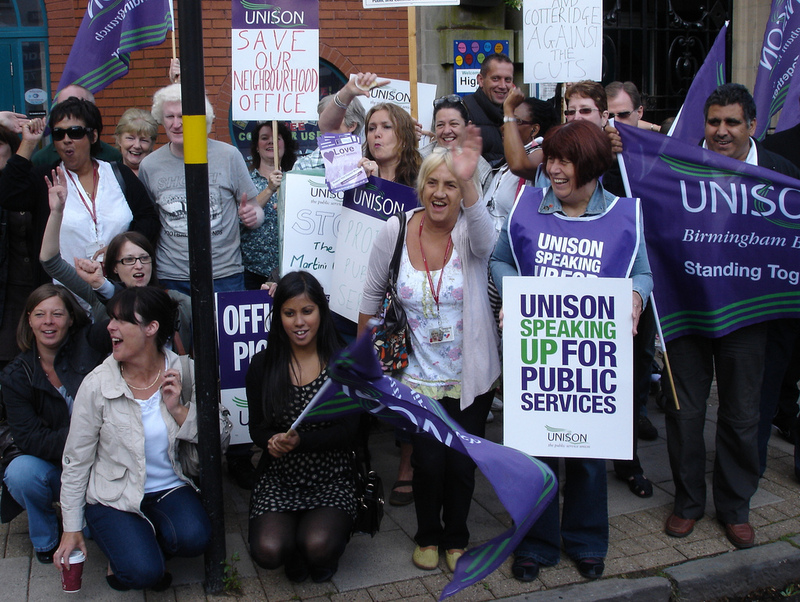 Local government workers are not even being offered the £250 raise that other public sector workers are seeing. The employers are refusing to take part in discussions over the pay claims. 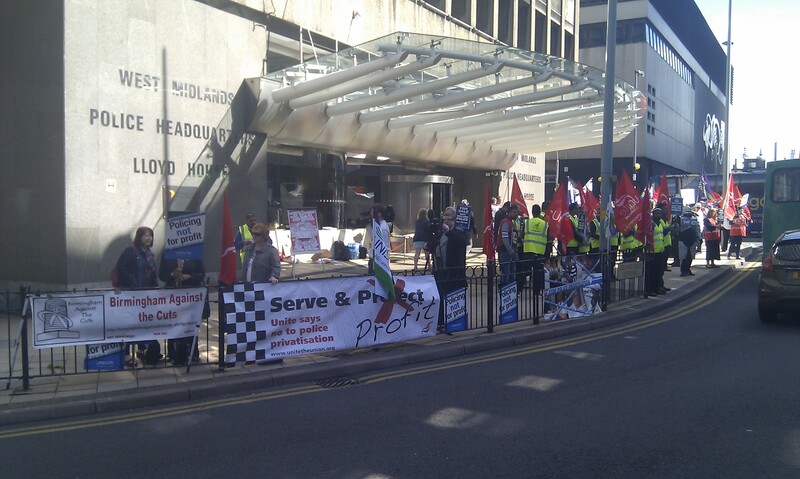 The demonstration heard from Unite officials and workers who spoke about the cuts. A Unite official spoke about how local government employers are refusing to take part in talks, because they know that they are in the wrong for imposing pay freezes. An excellent demonstration for a group of workers who are under heavy attack both locally and nationally from the swinging council cuts imposed by the ConDem coalition. 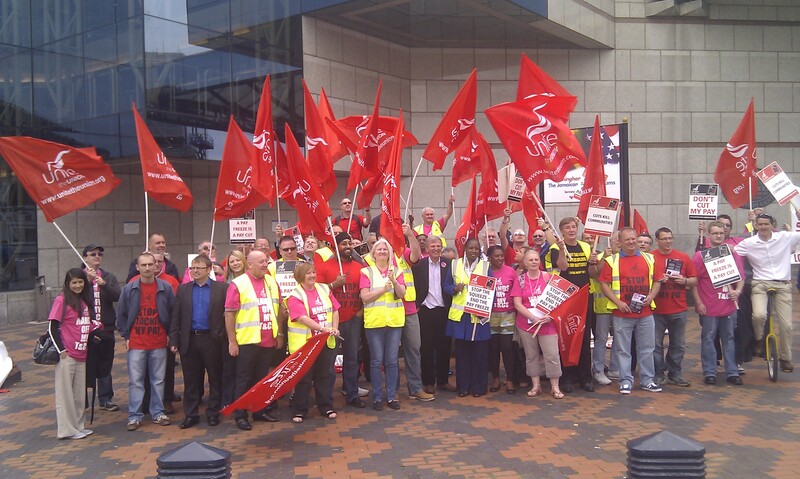 Unite the Union are holding a demonstration tomorrow, 26th June, at the Local Government Employers’ annual conference, at the ICC on Broad Street, B1 2EA. Meeting at 11am in Centenerary Square. For a third year in a row, workers employed in local authorities across the country have had their pay claim rejected by the employers. As a result, since 2009 the men and women who care for our elderly, empty our bins, keep our streets clean and safe, work as youth workers, teaching assistants, librarians and social workers have had their pay slashed by a staggering 13%. The pay of local government workers is shrinking against a backdrop of many years of below inflation pay rises and the fastest rise in the cost of living in the last 20 years. Most are now struggling to make ens meet. Local government workers are not the high earners that the government would have us believe – 70% earn less than £21,000 a year and almost half earn less than £17,802. Three years of pay cuts is way too long – and plans to abolish the separate bargaining arrangements is yet another blow to this embattled workforce. This has nothing to do with sharing the pain of deficit reduction, but has everything to do with breaking our public services. Local government employers have inflicted three years of pay freezes on its loyal workforce. These are not the highfliers who caused the economic crisis, yet they are being made to pay for it. Local people need local services delivered by fairly paid local government workers. Show your support and join the protest. 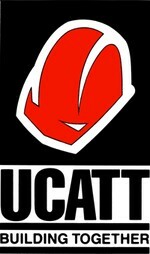 For more information, see the Unite People, Pay, Pensions campaign page. 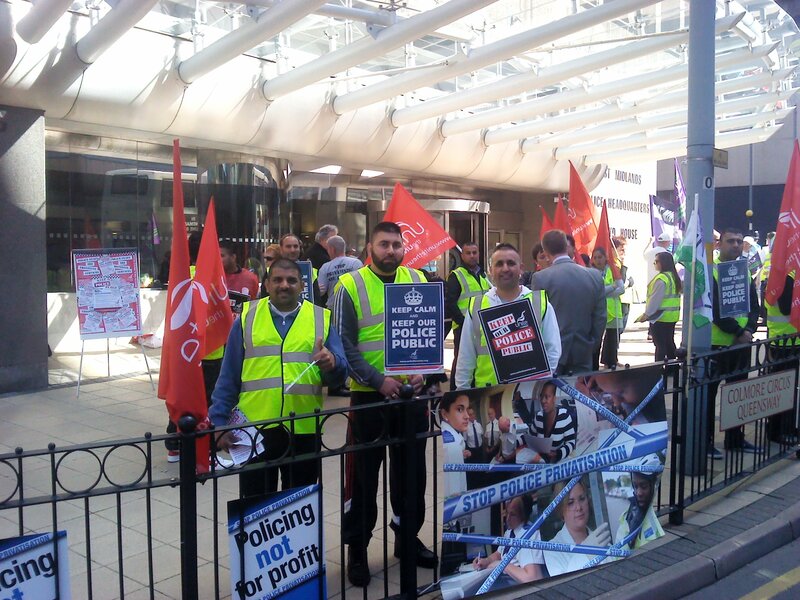 Thursday was a busy day in Birmingham, with a meeting about the privatisation of police, a demonstration at Sandwell Hospital about the use of workfare labour by Sandwell and Birmingham Trust and a public meeting about cuts to railway staff and fare hike rises. 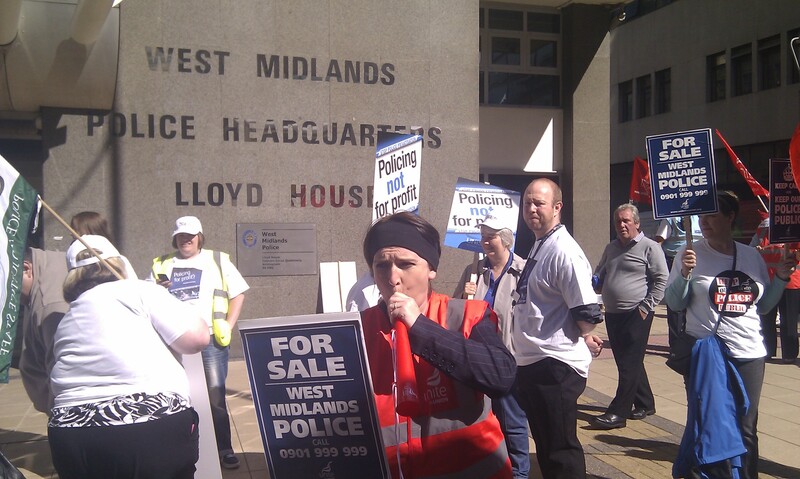 You can read about the police privatisation demo here. 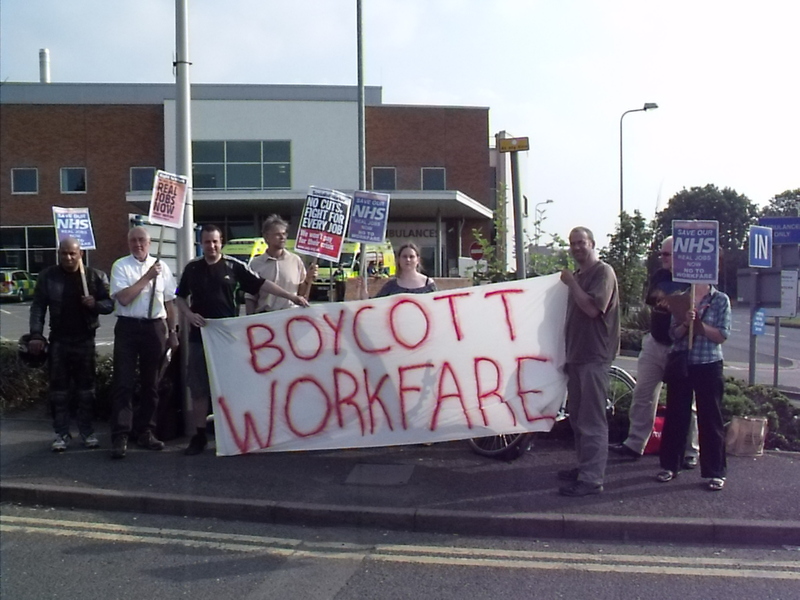 Around a dozen local residents and workfare campaign activists demonstrated outside Sandwell Hospital, where unemployed people are being forced to work for their benefits, undertaking activites such as cleaning and tidying wards and delivering food and drinks to patients. You can read more about why we oppose workfare here. 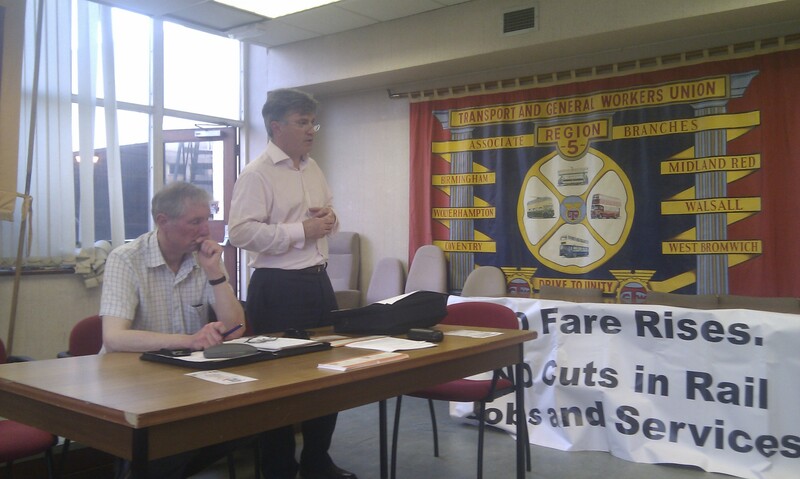 A public meeting called by Birmingham Trades Council and the railway unions RMT, Unite, ASLEF and TSSA to discuss the McNulty Report and attached command paper which recommends the closure or reduction in hours of 87 out of 90 London Midland ticket offices (which includes the Centro local railway system). This comes alongside above-inflation rail fare hikes to one of the most expensive (and definitely the most confusing) ticketing systems in the world. Many stations around Birmingham are looking at being completely unmanned, with only automatic ticket machines available for use – assuming they haven’t been vandalised. This can only lead to people getting the wrong tickets or paying more than needed. No machine can have the knowledge or skill to navigate the huge number of different tickets to ensure that railway users get the cheapest correct ticket available to them. Having unmanned stations will also lead to increases of crime at stations and no doubt far more litter and graffiti around as well. The situation may become so bad that the train operating companies or whoever runs the station decides they need people are at the station and get involved with workfare schemes to get free labour to replace the paid jobs, as happened with Finsbury Park London Underground Wardens. The unions are running a campaign – Action For Rail, and you can get involved with this right now by writing to your MP – go to their site for letter templates and more details about the campaign. You can watch Mick Cash’s talk in full for more details about the McNulty Report & command paper, and how they will affect your railway services. Start acting now before the staff get removed and ticket offices closed – they won’t be re-opened, just replaced with unpaid workfare labour at the taxpayers expense… and the private railway companies already get far more money from us than British Rail used to cost. 1) Job Losses – 2,450 council posts will be cut this year (7,000 over 3 years) and 5,000 posts privatised (making it easier to cut funding in the future). Birmingham already has an unemployment rate twice the national average and cannot afford to lose thousands more jobs. 2) Adult Care Services – 11,000 people who currently receive care having been assessed as having “substantial” care needs will no longer be eligible for home care, day care or residential care and will lose their care services. Overall, more than £33million will be cut from Adult Care Services, affecting older people, those with learning and physical disabilities and people with mental health problems. 3) Youth Services – £3m will be cut from Birmingham Youth Services budgets. Such a cut would close over 40 youth projects (more than 2/3rds) across the city and deprive young people and communities easy access to trained and qualified youth workers. 4) 1,600 jobs to go at Heart of England PCT, affecting NHS services in this city, and this is only 1 of 5 PCT’s to serve Birmingham so there will probably be more job losses to come. 5) Neighbourhood Office and CAB closures – CAB has been temporarily saved but neighbourhood offices are still under threat. Both of these provide vital and free advice on financial, legal & housing problems and council services. As unemployment rises, these services will become more important. 7) £1.3 million cuts in library services, £1 million cuts in grants to arts and £1.25 million cuts in funding for Museums with entry charges “almost decided”. Ikon Eastside will be closing, and this will probably just be the first of many cultural venues in Birmingham to shut down. 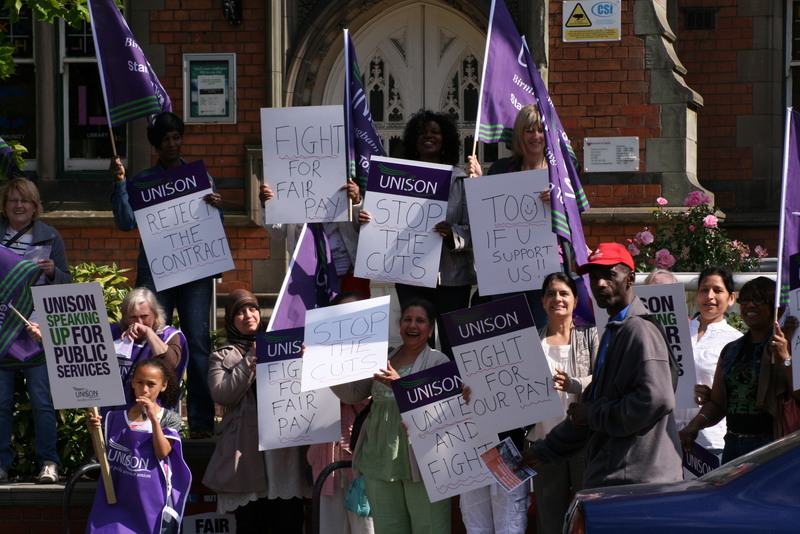 8 ) Pay Cuts and terms and conditions reviews for 26,000 council staff including refuse workers who have already been on strike. 10) There are alternatives. False Economy maintain a nice collection of alternatives, including closing the tax gap, a robin hood tax on the bank, green jobs for growth and other solutions to the deficit problem and banking crisis that will not involve huge spending cuts in vital areas. Of course there are many more than 10 reasons to march on Saturday against the council cuts. These cuts will affect every person in this city, and every person has their own reason to come. The demonstration assembles at 12 noon, Birmingham Cathedral, St. Philips Place. Caroline Johnson (Birmingham Against the Cuts).